The Liberation Tigers have advanced close to Jaffna city centre as their offensive in the northern peninsula continues, the LTTE said Thursday. The Tigers have also overrun two key Sri Lanka Army (SLA) bases at Kovilakandy and Thanankillappu in another prong of their operation, the organisation said in a statement from its London offices. "The combat units of the Liberation Tigers of Tamil Eelam (LTTE) achieved spectacular military gains in the battle of Jaffna today when they advanced close to the city centre in the Jaffna municipal area and overran two major military bases in the Chavakachcheri sector. "After heavy fighting that continued from early morning till late tonight in the vicinity of the Jaffna municipal area, the LTTE forces have brought under its control the entire Ariyalai region and Columbuthurai jetty. The advancing combat formations of the Tamil Tigers have destroyed several military camps in that sector and are now positioned 1 kilometre from the Jaffna kachcheri, the administrative centre of the city. "In the Chavakachcheri sector the Tamil Tigers overran two massive military bases at Kovilakandy and Thanankillappu today evening after two days of intense fighting. Overwhelmed by the fury of the Tiger assault the Sri Lankan troops gave up their resistance and fled in total disarray. 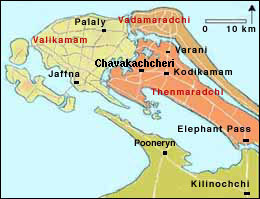 The fall of these strategically crucial military bases has made Chavakachcheri town vulnerable to LTTE assault. "Sri Lankan troops have suffered heavy casualties in the ferocious fighting near the Jaffna city centre and at Chavakachcheri sector. A huge quantity of arms and ammunition has been recovered from the two military bases overrun by the Tigers today. "As the LTTE forces are enclosing towards the heart of Jaffna city and Chavakachcheri town, the political wing of the Tamil Tigers has called upon the Tamil civilian masses to move to safety areas away from battlefronts."